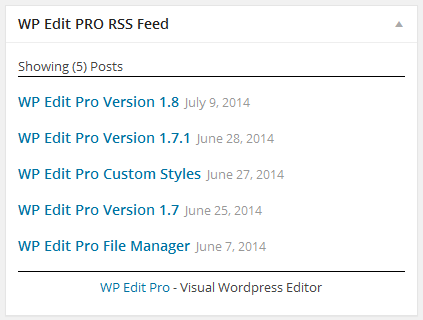 Upon installation of WP Edit Pro, two new dashboard widgets will be created. One showing the latest posts from our WP Edit Pro website, and the other showing latest articles from our Knowledge Base website. Hovering the mouse over the title of the dashboard widget will display a “configure” link. 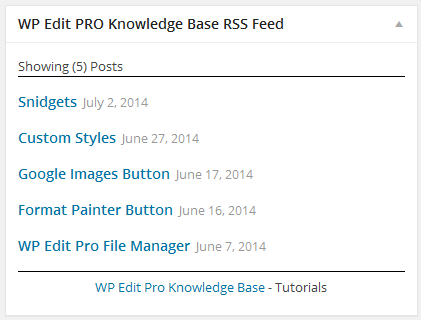 Click the link to configure how many posts the dashboard widget will display. Checking the option to “Disable Dashboard Widget” will remove these widgets from the WordPress dashboard. Remember, dashboard widgets can be moved around the dashboard. Click the title of any dashboard widget, hold the mouse button, and move it to a new location.